Silk Stalkings: Mystery and Suspense on Television. 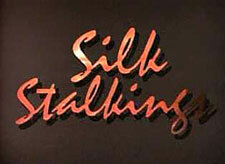 Silk Stalkings initially aired on CBS as part of its late night dramas and later aired on the USA Network. The series ran from November 1991 through April 1999 and included 176 episodes over 8 seasons. The series original premise was a pair of divorced ex-partner police detectives (Rita Lee Lance, played by Mitzi Kapture, and Chris Lorenzo, played by Rob Estes) who are partnered again to solve crimes of passion in Palm Beach, Florida. Kapture and Estes left during the 5th and were replaced by a series of partners, followed by Tom Ryan (played by Chris Potter) and Cassandra St. John (played by Janet Gunn) for the final 3 seasons. 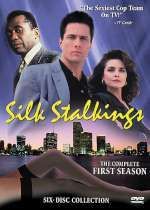 Silk Stalkings was created by Stephen J. Cannell who also associated with many other television crime series, several featured on this site, including 21 Jump Street, Adam-12, Baretta, The Commish, The Greatest American Hero, Hardcastle and McCormick, Hunter, Quincy M.E., Riptide, The Rockford Files.